THC and CDB are two of the primary cannabinoids that are naturally found in the plant, Cannabis Sativa. THC stands for tetrahydrocannabinol and CBD stands for cannabidiol. When taken, both of these chemicals react to the brains neurotransmitters which, in turn, have a certain effect on the body and the brain. The effect that THC has is different than the effect that CBD has. CBD is the extracted part of the plant that will not give you a high as it is not a mind-altering drug. Instead, it has other beneficial medicinal effects such as reducing anxiety and calming the nervous system. CBD can be found in many natural supplements and does not necessarily require a doctors prescription. There are many medical benefits of both THC and CBD for those struggling with cancer, infection, or illness. CBD and THC are often suggested for those who have epilepsy, pain, depression, ADHD, substance abuse, and IBS. 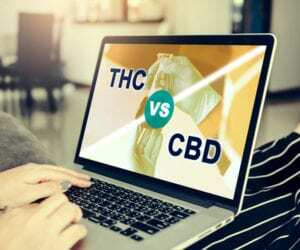 THC differs from CBD in that it is classified as an illegal drug although an increasing amount of states across the U.S. have legalized the recreational use of marijuana. Cannabis is grown in various climates throughout the United States. California’s emerald triangle region, located in the northwest, boasts the perfect climate for marijuana to grow. It is estimated that approximately 1.7 million pounds of cannabis are grown each and every year in the U.S. Washington is also a main grower and supplier of indoor-grown cannabis. There are two distinct varieties of cannabis plants which are Indica and Sativa. Each of these strains has its own unique qualities and effects which will vary from person to person. Indica: Indica plants are stubbier and more busy with wide leaves. They gro quicker than sativa plants and produce a product that is higher in CBD and lower in THC. Sativa: The sativa plant is tall and thin in nature with narrow leaves. There is a longer growth period involved and they demand more light. This plant produces cannabis that is higher in THC and lower in CBD. Marijuana can also be highly addictive. If you have found yourself increasing dependent on marijuana, treatment is available. The continued use of marijuana when not doctor-prescribed can be hazardous to your health.